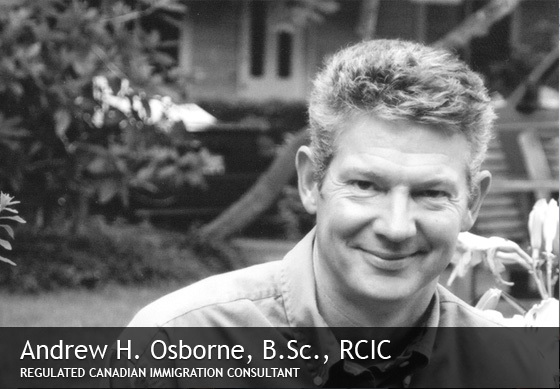 Andrew H. Osborne, B.Sc, RCIC Regulated Canadian Immigration Consultant With 18 years experience as a Senior Immigration Officer, Minister's Delegate, and Analyst with CIC, my knowledge and experience with the immigration department will be invaluable to you in any immigration application you need to make. Let me assist you in preparing your very best case for the processing office in Canada, port of entry (airport or border-crossing) or the visa office overseas. Errors, omissions and incomplete/returned applications can cost you dearly in lost time and processing fees. I can help you avoid costly delays, pitfalls and omissions. I would be pleased to meet with you to discuss your case, identify your best options and assist you in your application.